This volume presents world-leading ideas and research that explores some of the most prominent topics relevant to detecting terrorism. The book is divided into six key themes: conceptualising terrorism, deception and decision making, social and cultural factors in terrorism, modelling hostile intent, strategies for counter-terrorism, and future directions. Twenty two chapters cover the spectrum of detecting terrorist activities, hostile intent, crowded public spaces and suspicious behaviour. The work draws from high impact research findings and presents case-studies to help communicate concepts. Specific areas of interest include methodological issues in counter-terrorism, counter terrorism policy and its impact on end users, novel research methods and innovative technologies in counter-terrorism. A variety of disciplines are represented by this work, including: ergonomics/human factors, psychology, criminology, cognitive science, sociology, political theory, art/design, engineering and computer science. This book not only expands the knowledge base of the subject area and is therefore of prime relevance to researchers investigating counter-terrorism, but provides a valuable resource to security stakeholders at policy and practitioner levels. Dr Alex W Stedmon FIEHF CPsychol CSci FRSA is a Chartered Psychologist, Fellow of the Institute of Ergonomics and Human Factors and Fellow of the Royal Society of Arts. He is a Reader in Human Factors at Coventry University. He worked for the Ministry of Defence before moving into academia and explores human factors issues of technology use in security applications as well as contextual methods for investigating suspicious behaviours in various security related domains. Alex was one of the technical leads for a strategic security consortium (EPSRC project: ’Shades of Grey’) and received Centre for Defence Enterprise funding for projects on: human factors of automated CCTV; identifying human pheromones associated with deception; and collaborative intelligence information gathering. 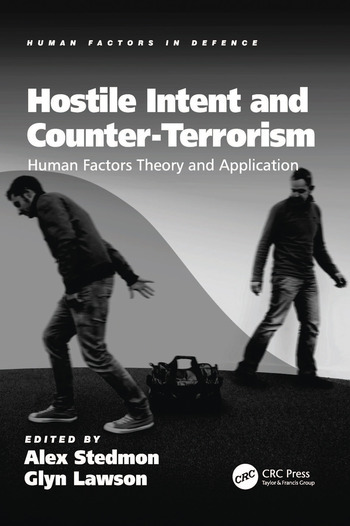 Alex has co-edited special issues of ’Applied Ergonomics’ (44/2013: ’Detecting terrorist activities: Hostile intent and suspicious behaviours’) and ’The Journal of Police & Criminal Psychology’ (28(2)/2013: ’Terrorism psychology: Theory and application’). Dr Glyn Lawson FIEHF - is a Lecturer within the Faculty of Engineering and a member of the Human Factors Research Group at The University of Nottingham. His research expertise includes the human-centred development of new technologies in design and engineering applications. Glyn has particular expertise in the evaluation of methods for predicting behaviour in emergency situations. He has also conducted research on deception detection and worked on requirements capture within the Security domain. Glyn is a Fellow of the Institute of Ergonomics and Human Factors and sits on the Education and Training panel. Glyn also co-edited the special issues of ’Applied Ergonomics’ and ’The Journal of Police & Criminal Psychology’ focusing on detecting terrorist activities and terrorism psychology.